The whole seat just about done now, so I will get the final pictures up soon. 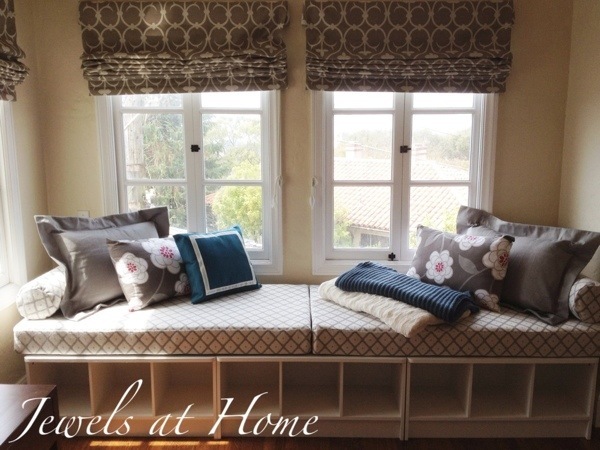 So far, I have shared the bench cushions, and today, I’ll show you some of the special pillows I sewed to dress it up: round bolsters, flanged shams, and a ribbon-bordered pillow. 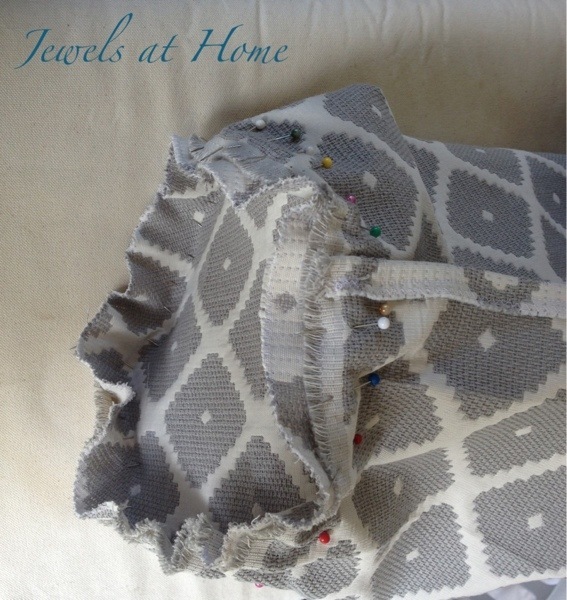 I’m not going to go into the basics of how to sew throw pillows, as you can find that in this old post. 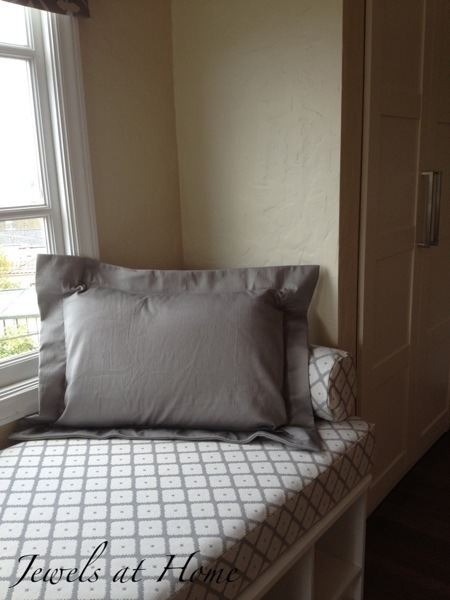 This was just a basic pillow, and I used to add ribbon the same way I did for our master bath curtains. This time, I did sew down the ribbon as well. Okay, I’m pretty proud of these. I was feeling intimidated by sewing the circles, but now that they are done, I’m so pleased! 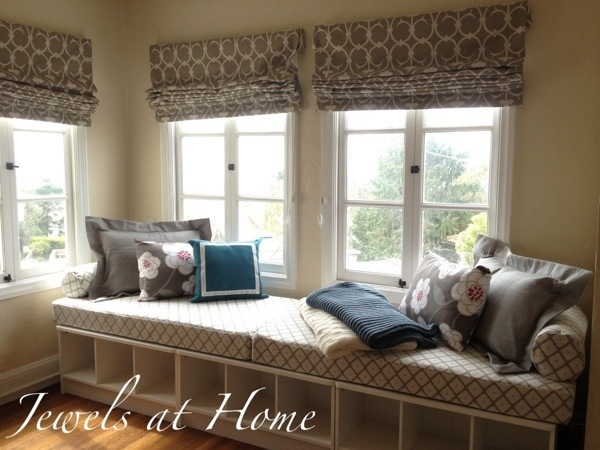 I made these round bolsters out of the same fabric, Robert Allen Souk in Dove, that I used for the bench seat. 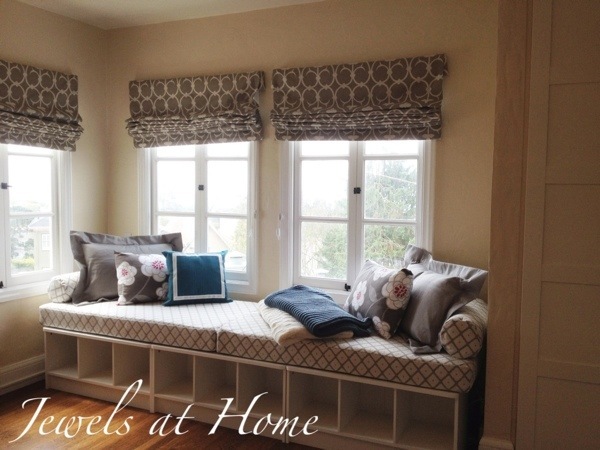 They sit on either end and really make the daybed feel finished. The pilllow design is very simple, with just three pieces and some velcro. 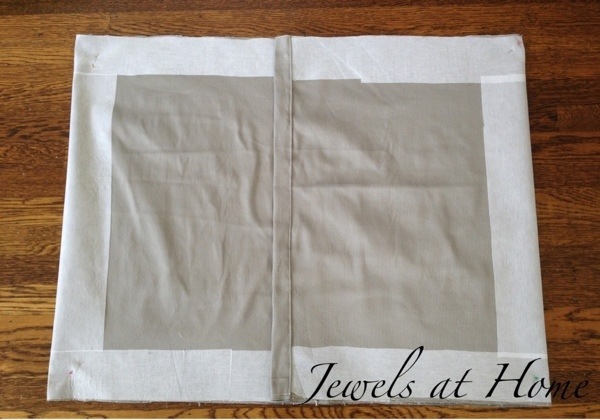 For each pillow that has a finished size of 24″x 8″ diameter, I cut a rectangle that is 25″ wide by 27″ long. I cut two circles that are 9″ in diameter (pictured below). I hemmed the short ends of the rectangle and finished all the other edges with a zig-zag stitch. 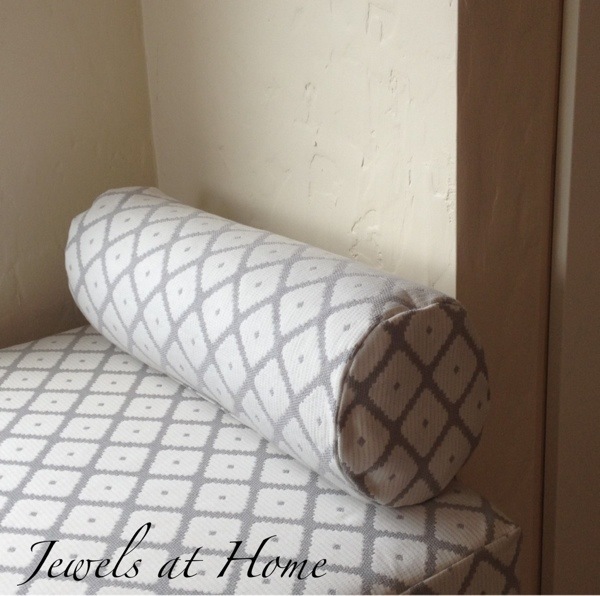 Three simple pieces for sewing a round bolster pillow. Next, I joined the two short ends of the rectangle, with one inch overlapping, to make a cylinder and pinned this in place. Then, I fitted a circle into the open end, with right sides facing. I used a lot of pins, to make sure that it fit evenly (pictured below). Form a cylinder with the rectangular piece and fit a circle into the open end. I sewed the circle into place by hand (pictured below). You could definitely try this by machine, but my fabric was quite stiff, and I thought I would just end up with a jagged circle and unpicking it 10 times. Repeat on the other end. Stitch the circle onto the open end of the cylinder. 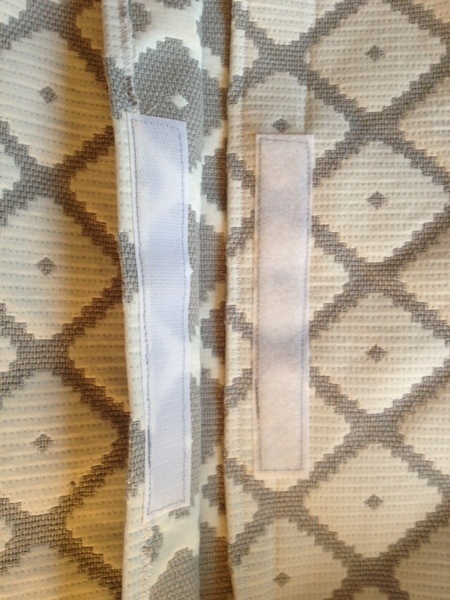 Last, I added Velcro to the long opening to hold the pillow closed (pictured below). Add velcro for the pillow closure. 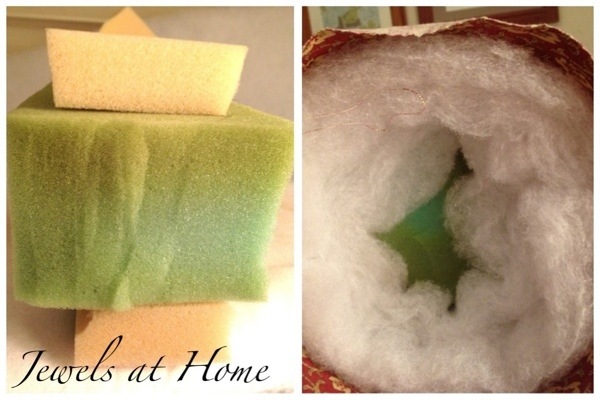 What’s inside my bolster pillows? You can purchase these forms, but I was able to construct some pillow forms from supplies I already had in the house. Yes, that’s right. While I may fantasize about being on HGTV, I think I have a better shot at getting on Hoarders. I used one thick piece of foam and two thinner strips for the core of the pillow, wrapped it all in batting and then stuffed it all in a simple tube sewn from scrap fabric (pictured below). Making a pillow form for a round bolster pillow. And here’s the finished bolster pillow. Something about conquering those circles is very satisfying! I wanted pillows of different sizes on the daybed, so I beefed up some standard 20″x26″ pillows by sewing flanged covers. 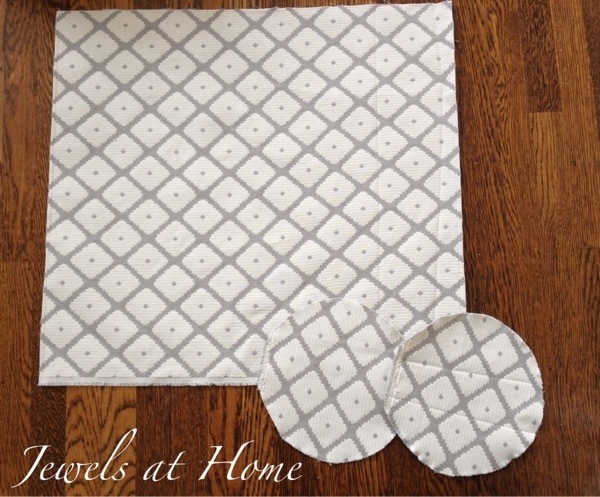 For this project, you’ll need fabric, fusible interfacing, velcro, and thread. I cut a large rectangle 29″ wide x 70″ long and hemmed the two short ends. I cut the fusible interfacing into 3″ strips and ironed the strips into place along the long sides of the rectangle and cut 6″ strips to sew, as show below, where the sides of the pillow will be. Iron strips of interfacing onto the inside of the pillow cover. I folded the rectangle as show below, so the hem overlaps on the back where the closure will be. I stitched along the top and bottom edges. 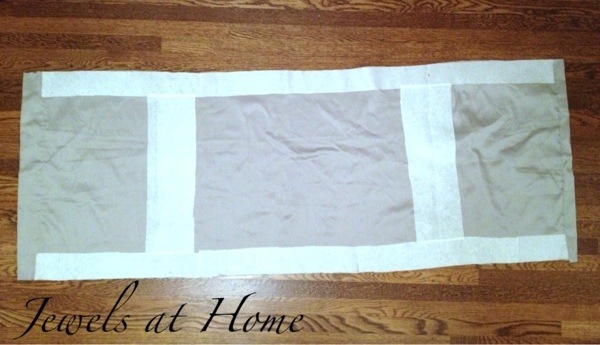 Fold the rectangle to make the pillow cover, and sew with the right sides together and the interfacing on the outside. 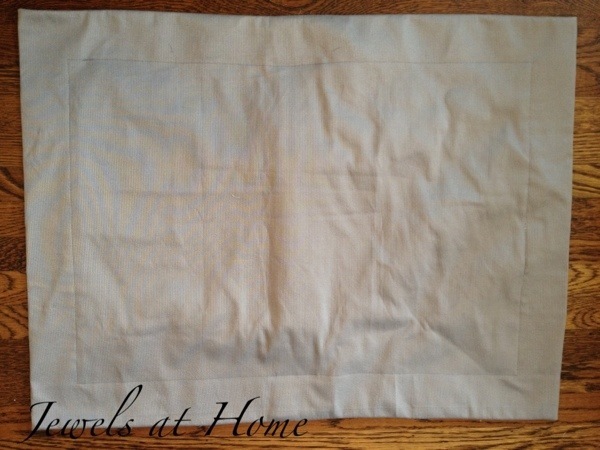 Then, turn the pillow cover right side out, iron, and sew around the pillow 2 1/2″ from the edge. I put a strip of painter’s tape on my machine to mark this distance (shown below). 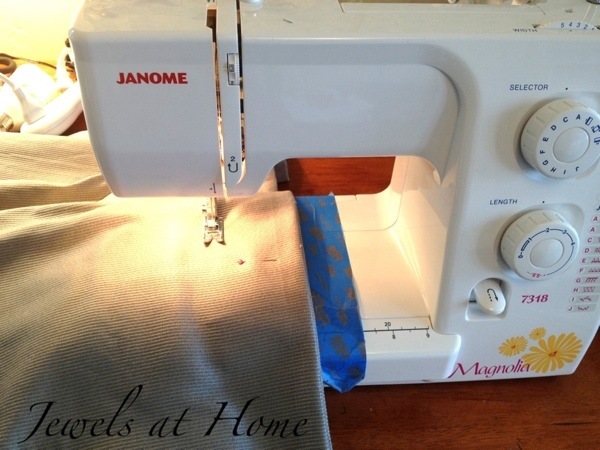 Sew around the pillow cover on the outside, 2 1/2″ from the edge. Ta-da! 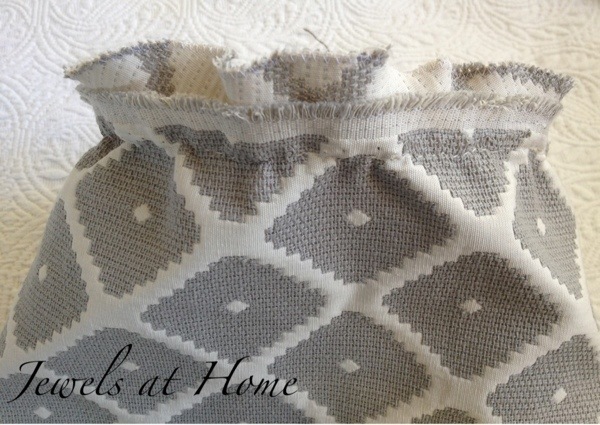 Pillow cover with edges that will stand up nice and crisp! 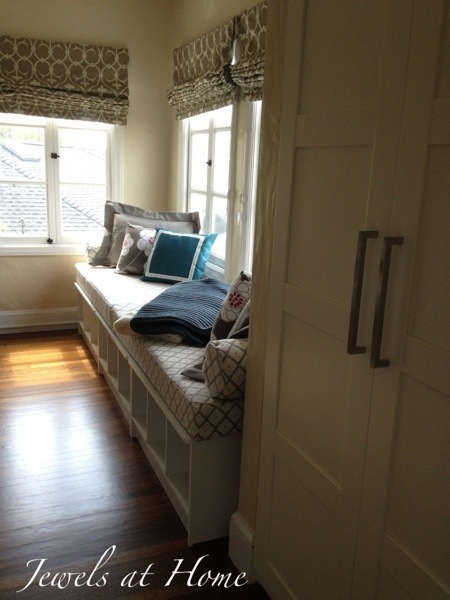 And here’s how the window seat is looking so far, with all the pillows and throws. I just need to finish the storage boxes to go below, and I’ll be done! 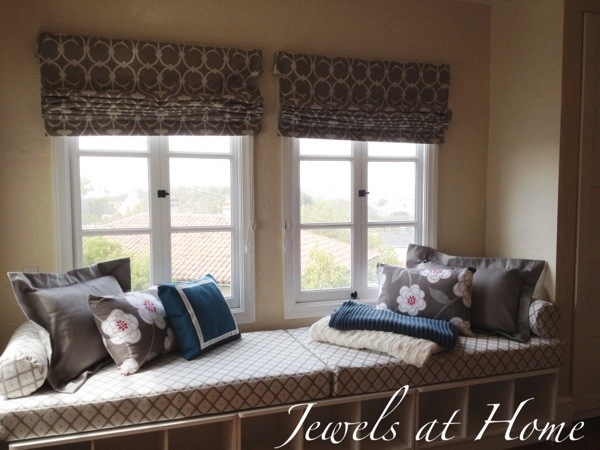 This is one of the projects that got me so excited I could barely sleep, so it feels good to be almost done… I might need to catch up on sleep with a nap on this cozy daybed! 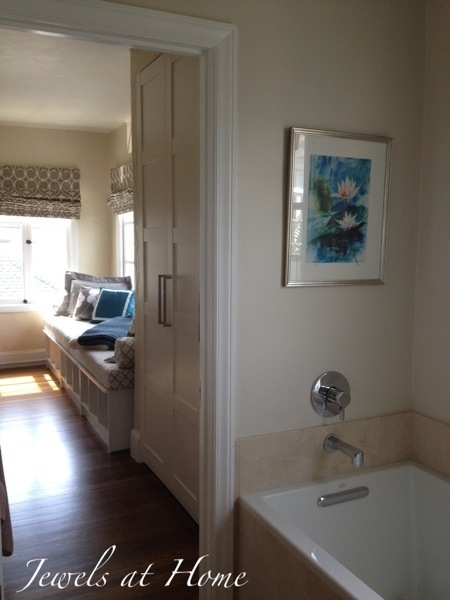 The blue pillow and knit throw tie into the art in the master bathroom. Ahhh…. Not much longer until I’ll show you the finished project with all the details! I recently purchased new bedding for an existing daybed that didn’t come with bolster pillows. I would like to recover the old ones with a coordinating fabric. I am not a seamstress but thought I could follow your directions – I’m not sure why the fabric length is 72 inches long and what happens to all the fabric? Also after you attach the circles are you turning the cover inside out? A little more description would really help me to actually try this! Beautiful job by you on the whole bed. Thank you for your comment, and I’m so sorry for the confusion! I made a typo, and it’s 27″ long (not 72″). Since you’re recovering existing pillows, you can measure yours. The length of the fabric should be 1″ longer, to give you a .5″ seam allowance on each end. Add 2″ to the circumference (distance around) to allow for hemming the ends and some overlap for the Velcro. As for adding the circles to the end, do that with everything inside out, so the seam is on the inside, and then flip it when you’re done sewing. Let me know if you have more questions. Sorry again for the typo! Thanks so much for the prompt reply! I am going shopping for material and give it a shot!